A big push near the end of the Kickstarter campaign has pushed it over the line. Update: And just like that, it's done: The Kickstarter campaign is now sitting at $622,000 in backing on a roughly $619,000 goal. (The campaign's native currency is actually Japanese Yen, so the conversion can fluctuate somewhat.) That leaves a little over two days for the $800,000 Nintendo Switch stretch goal, which leads me to think that it isn't likely to happen. Assuming that's the case, White Owls said the overage will go toward creating extra content for the game, like more outfits, seasonal content, and music. Details on that will be revealed in a future update. A week ago it looked like The Good Life wasn't going to make it, but the release of a free demo and a late burst of enthusiasm has brought the Kickstarter drive, at the time of writing, to $582,000. The game will be funded at $619,000. There are 61 hours to go, and it's an all or nothing drive. That means if the fund doesn't meet the target, backers aren't charged and the devs don't get anything. The devs describe The Good Life as "a Daily Life Simulator x SWERISM." SWERY, aka Hidetaka Suehiro, wrote and directed wobbly cult fave Deadly Premonition, and made part of a cancelled episodic story game called D4: Dark Dreams Don't Die, which we quite liked. Both games are feature odd social situations and screwball humour. It looks as though The Good Life will deliver sweriness at a more relaxed pace. 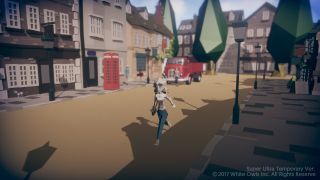 You play as a New York journalist trying to pay off massive debt in a quaint British town called Rainy Woods. The strange thing about Rainy Woods, except that it is somehow sunny in Britain, is that the inhabitants transform into cats and dogs in moonlight. There has been a murder, and now you have to solve it in human, cat or dog form. The 'life simulator' aspect involves taking odd jobs around the town and using your photography skills to make money with the local paper. You can take part in typical small-town British activities—"shear sheep, deliver milk, make jam and hay, do some gardening, or work as a bartender, a casino dealer, a miner, or even mine for cryptocurrency if you want to!" It sounds like it could be fun, and quite weird. The Kickstarter campaign concludes this Saturday.